MCC Selects Morocco, Five Other Countries Eligible for New Programs – State Dept. MCC’s work is based on the principal that aid is most effective when it reinforces good governance, economic freedom & investments that promote economic growth & help eliminate extreme poverty. US State Department, MCC (Washington, DC, Dec. 26, 2012) — At its quarterly meeting December 19, the U.S. Millennium Challenge Corporation (MCC) board of directors selected Liberia, Niger, Sierra Leone, Morocco, and Tanzania as eligible to develop proposals for new compacts, and Guatemala as eligible for a Threshold Program. Examples of the types of reforms pursued by these countries range from new asset-disclosure requirements in an effort to combat corruption in Liberia to the introduction of free access to maternal and child health care in Sierra Leone to a dramatic increase in environmental protection in Niger. The MCC Threshold Program is designed to help countries that are not yet eligible for MCC compacts but have demonstrated a significant commitment to improving policy performance on MCC’s selection criteria for compact grants. MCC works with Threshold Program countries to enact targeted policy and institutional reforms focusing on the policy areas underlying MCC’s eligibility indicators: ruling justly, investing in people and economic freedom. To date, MCC has signed Threshold Program agreements with 21 countries totaling more than $495 million. An MCC compact is a multiyear agreement between the MCC and an eligible country to fund specific programs targeted at reducing poverty and stimulating economic growth. Two current MCC compact countries—Morocco and Tanzania, were selected as eligible to develop second compact proposals. The countries have continued to perform well on the MCC scorecard and have been good development partners during first-compact implementation, MCC said. Second-compact eligibility depends on successful implementation of the first compact, continued good policy performance and development of proposals that have significant potential to promote economic growth and reduce poverty. The board also chose Guatemala as eligible for a new Threshold Program. Guatemala is extremely close to meeting the MCC scorecard criteria, passing 10 indicators, including the Democratic Rights hurdle, and performing exactly on the median for Control of Corruption. In addition to the new selections, the board re-selected Benin, El Salvador, Georgia and Ghana as eligible to continue developing compact proposals and Honduras and Nepal as eligible to continue developing Threshold Programs in 2013. No eligibility determinations were made for countries that have already signed compacts since these countries do not require annual re-selection, MCC said. More information on the MCC and its work is available on the corporation website. 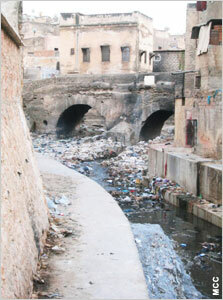 Existing conditions at the Bim Lamdoun Bridge. 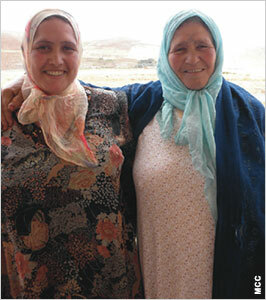 Building community consensus for participatory development projects is a strong point for the High Atlas Foundation.